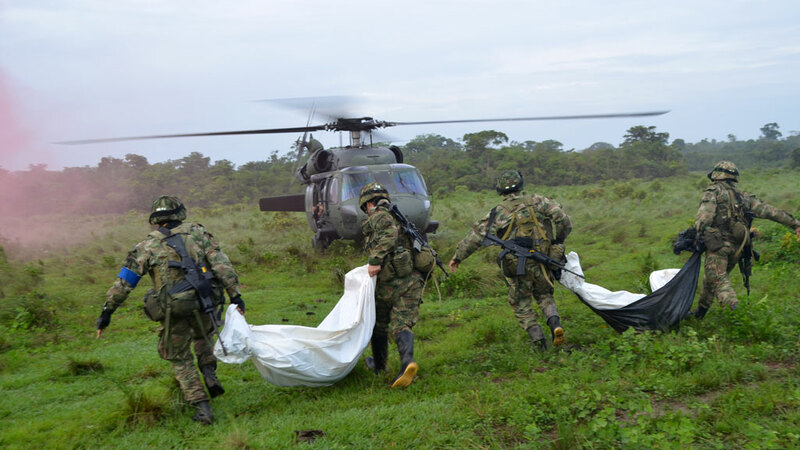 Despite being scrutinized over the killing of thousands of civilians, Colombia’s armed forces continued killing civilians to present them as guerrillas killed in combat throughout 2014, according to the United States government. The report came one day after Human Rights Watch (HRW) caused an uproar in Colombia, alleging that Armed Forces commander General Juan Pablo Rodriguez and National Army commander Jaime Lasprilla “knew or should have known” about dozens of killings committed by members of brigades the military executives commanded at the time. For years, particularly under the presidency of former President Alvaro Uribe and most prevalently when current President Juan Manuel Santos was defense minister, the Colombian army executed approximately 4,500 civilians, dressed them up as guerrillas and presented them as combat kills in what in Colombia euphemistically is called the “false positives” scandal. The commanders of the brigades accused mostly of the mass killings ended up promoted rather than prosecuted. The prosecutor General’s Office announced the investigation of 22 generals earlier this year, but has charged none of the suspected generals. Rodriguez and Lasprilla are not even among the investigated generals in spite their implication in the execution of more than 70 innocent civilians. The US’ annual human rights report also amply reported on the military killings and the difficulty to effectively prosecute military officials accused of war crimes. “Investigations of past killings proceeded, albeit slowly. The Attorney General’s Office reported that through July, it had obtained 28 new convictions of security force members in cases involving homicide of a “protected person” (i.e., civilian), 19 new convictions in cases involving aggravated homicide committed by security force members, and no new convictions in cases involving “simple homicide” committed by security force members. All of the convictions corresponded to cases opened prior to 2014,” the report said. The Prosecutor General’s Office reported on Wednesday that 4,475 Colombians have been executed by the military, implicating 5,137 members of the security forces.